This new form of painting represented a tremendous innovation in the art world; now there was no ‘centre’ to the painting. There were no motifs, or upper and lower sections. The painting had become scattered with forms almost casually across the entire surface, but the forms were all alike. The pictures he was painting now did not reproduce nature, but appeared to be as inaccessible and remarkable as an empty and majestic countryside, the sea or the sky. 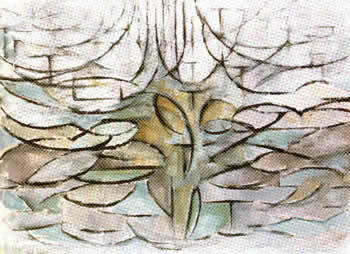 Several artists before Mondrian had attempted this impression of the infinite, one being Robert Delaunay with a series of paintings called Window Pictures, the Fenêtres Simultanêes. Mondrian must have seen these and had some influence; however he used the full range and potential of Cubist ideas for expressing uniformity and emptiness. In July 1914 Mondrian returned to Holland and was stranded for four years by World War I. He probably returned to see his sick father, but this is not clear and his motives remain a mystery. While home he revisited Domburg and sketched familiar subjects: the church, dunes, piers, sea. Living in Laren, he turned these sketches into abstract schema of horizontal and vertical dashes expressing what he called "the expansion, rest, and unity" of nature. Apple Tree in Flower (1912).